Looks like I am heading back to MB for the first time since 2010, which was the snow year that caused the race to be cancelled. I had entered the half that year for the first time and was planning to use it as a test and training run in my quest to re-qualify for Boston at the Tobacco Road Marathon a month later.After the race was cancelled I hadn't really planned on returning any time soon as there are so many races that I love to do around the same time of year. Funny thing is that I almost never ran at Myrtle Beach to begin with but thanks to some special friends I ended up deciding to go run the marathon in 2005 which began a string of 5 years in a row. "Jerry had introduced me to Karla Werner at the NCRC meetings but we were just casual aquaintences until this past Jan. Jerry told me that Karla was attempting her first marathon at Myrtle Beach in Feb 2005 and that she wanted to run 4 hours and qualify for Boston. I thought that was quite a lofty goal for her 1st. They were following an 18 week training program and Jerry was asking my thoughts on the program. I met them for one of their long runs on Jan.1st. We were joined by Margherita Scott (Margo) , another lady that Jerry had introduced me to. This was the beginning of special group in my life. 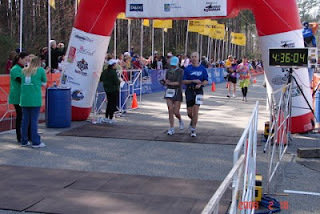 Jerry had been trying to talk me into running the Myrtle Beach Marathon, his favorite race but I had declined because it didn't fit in with my ultra schedule. When I learned that he was planning to pace Karla then I changed my mind. Jerry is a very good runner and a great friend but he runs with his heart. He really has no sense of pace and pays no attention to split times. I knew in the excitement that he would lead her out too fast and I couldn't let him ruin Karla's debut. I told Karla I wasn't going to be able to run the whole race with her. I had already run two ultra's in Jan. and was running the Uwharrie 40 mile two weeks before MB so I wasn't expecting to run a PR. I knew I could get her off to an even pace for the first 15-18 miles and then she would be on her own, with Jerry for company. Myrtle Beach turned out to be a great day. I was able to pace Karla evenly for 24 miles. She got her Boston Qualifier in 3:58 and I was able to continue and get a PR 4:00:40." This of course was the beginning of a wonderful friendship with THE Marathon Princess as I begin to call her during our training together to get me to Boston with her. If you are interested you can get that whole story from this link. Which brings us back to this year and why I am returning.You probably already know if you follow my blog regularly but in case you didn't know, last April after the Umstead 100, another of my "Angels" and training partners, Amy Surrette told me she wanted to back off the ultra's for awhile and make a goal of getting faster and qualifying for Boston. I told her I would do all that I could to make sure she was able to achieve that goal. We talked about it a lot , making plans on when she would like to make the first attempt and it just worked out that Tobacco Road this March was the first logical time to give it a try. So I begin planning our training and working with her so that it would fit into the other things she had going on for the remainder of the year and just as it did for me in 2010, it made sense to plan on a half at MB. So with the training going even better than expected we are prepared to go and take that test this weekend. We figure that for her to have a reasonable chance for the BQ next month that she needs to be able to run about 1:45 at MB and I am confident that she can do it. Stay tuned for the results ! I can't wait! I have zero doubt she'll get the 1:45. I think closer to 1:42 with even pacing and TWO Cherry Chocolate Cliff Gels! We're going to go conservative with the pacing for the 1:45 since this is a test and workout for the biggie next month. Hope to be at 1:45 pace at 10 and if there is anything in the tank then let her go for it. At some point later I know she can get to a sub 1:40 and who knows from there?